This dress was designed by Yves St Laurent (born 1936); the fabric was produced by Abraham and Bianchini Ferier. 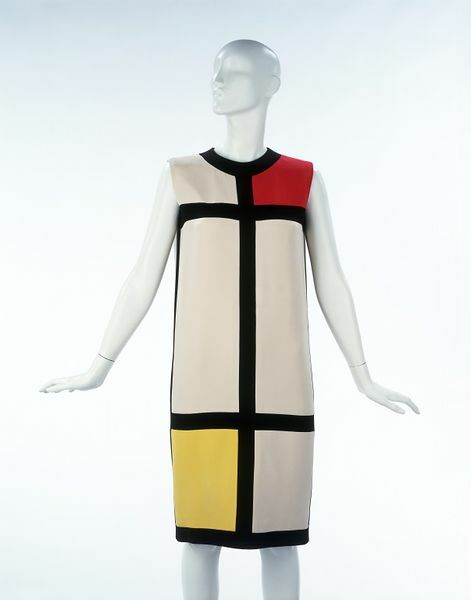 The dress was inspired by the abstract paintings of the Dutch De Stijl artist Piet Mondrian (1872-1944). Yves St Laurent designed a group of bold dresses based on intersecting black stripes and blocks of primary colours. It became known as the Mondrian Collection and was featured on the front of French Vogue in September 1965 and in many other fashion magazines. The designs were immediately taken up by mass manufacturers who made cheap copies. This dress forms part of the Cecil Beaton Collection. With great energy and determination Sir Cecil Beaton (1904-1980) contacted designers and the well-dressed elite of Europe and America to create this lasting monument to the art of dress. The collection was exhibited in 1971, accompanied by a catalogue that detailed its enormous range. Sleeveless, short straight cut dress of silk crêpe. It is pieced together with heavy silk crêpes, mainly white with geometric design carried out in horizontal and vertical bands of black. There is an inset panel of acid yellow on the lower right front and another of red on the left shoulder. The back is of black and white crêpe only. Lined throughout in fine white crêpe-de-Chine. 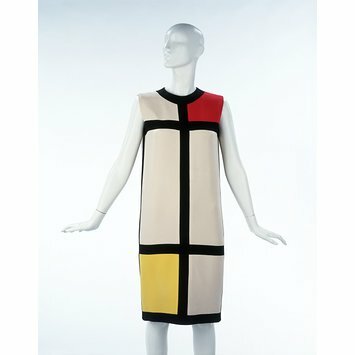 Cocktail dress of silk crêpe, 'The Mondrian Collection', dress designed by Yves Saint Laurent and textile made by Abraham and Bianchini Ferier, Paris, 1965.